As spring advanced our attention really started to focus at Hanwell on the Second Sluice and the adjacent terraces and ponds. 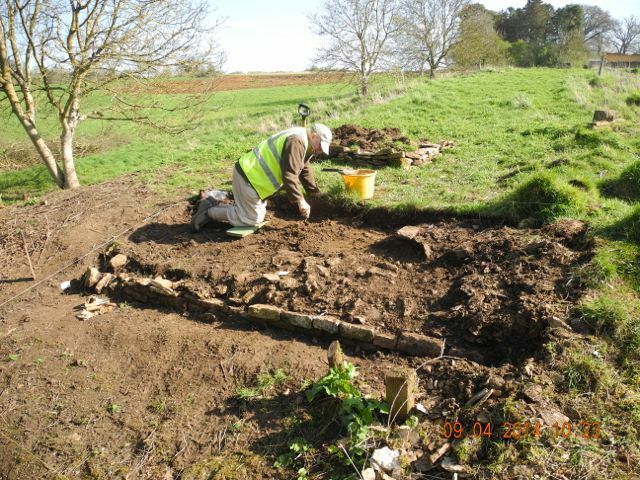 Having completed the earthwork survey last month and tidied up the excavation opened in 2013 it was time to really get to grips with the area formerly known as the Second Fishpond but now bearing the name the Moated Area. 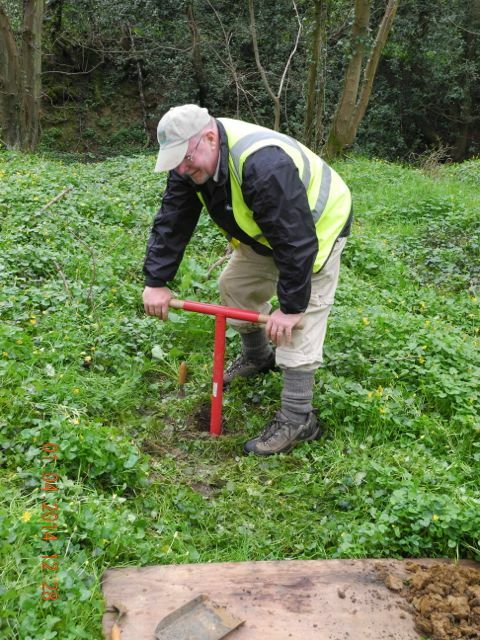 Once the gazebo was in place to act as base camp and refuge we began by surveying the curious miniature ridge and furrow that marked some of the central platform and then undertook some coring in key locations. 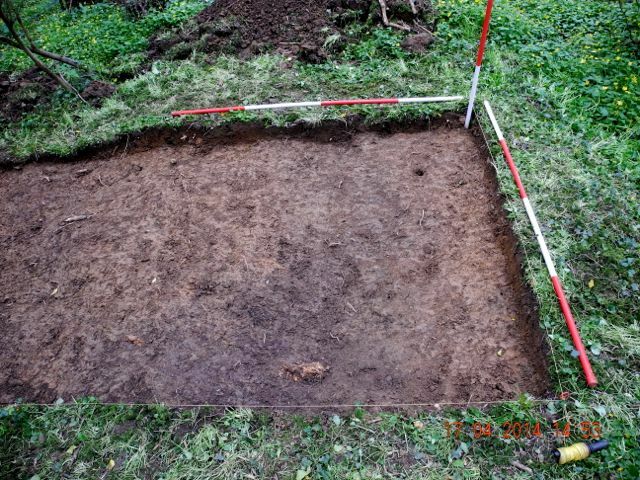 What we found was primarily redeposited clay but the central mound seemed to be of a different composition with fragments of tile and brick down to a depth of around 40 centimetres. Base camp established, it's all looking very green. Coring underway, we got down to a depth of around a metre but it was hard work. 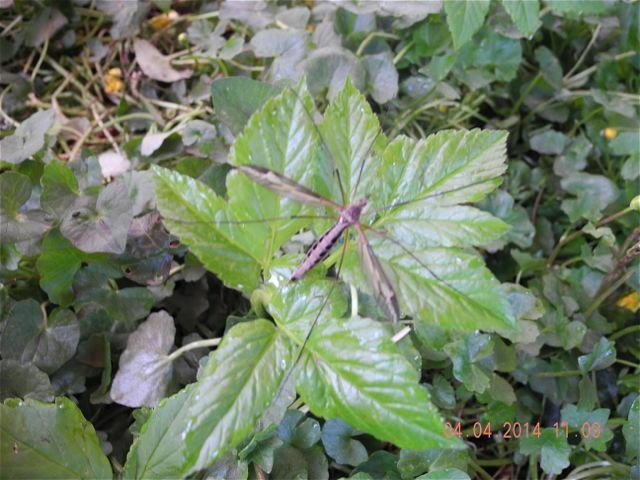 found mainly in woodland and known as Tipula maxima. 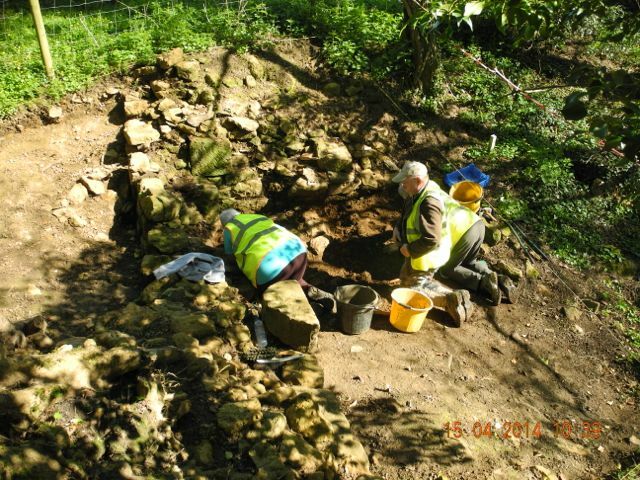 We were also able to begin again on serious excavation of the site of the Second Sluice which involved starting to remove a nondescript spread of rubble, probably debris from Christopher's quarrying operations. 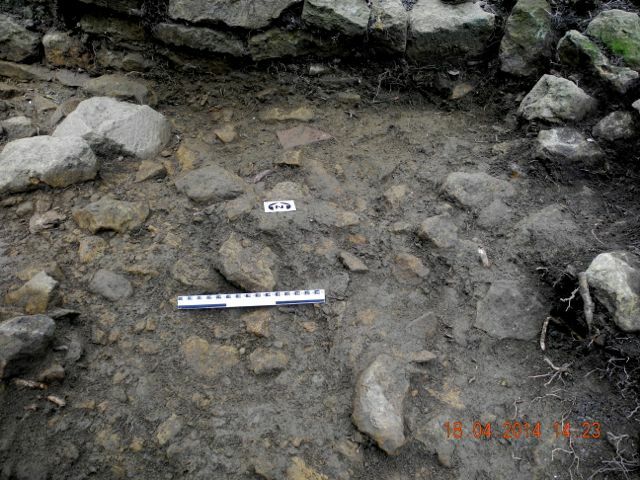 Underneath this in the corner between our two main walls was a very nice deposit of post-medieval pottery and another corner on a slightly different alignment. All very intriguing. 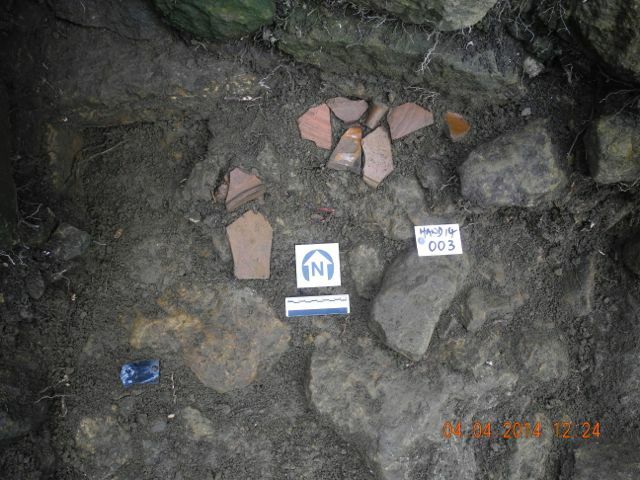 The pottery spread tucked into the corner and spread out after lifting. 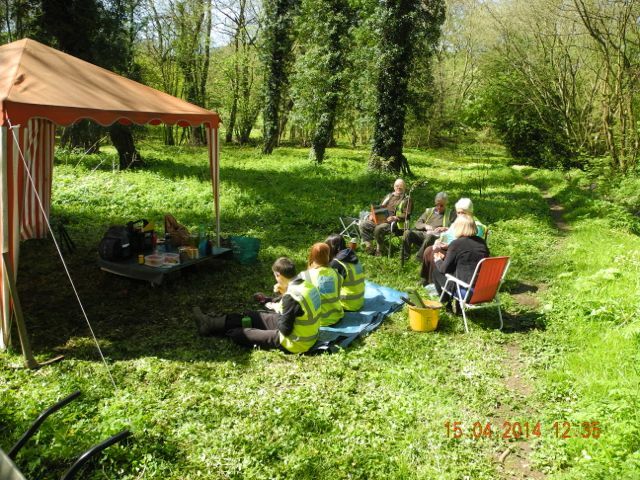 Later in the month we were down in Enstone and conditions were pretty well perfect. 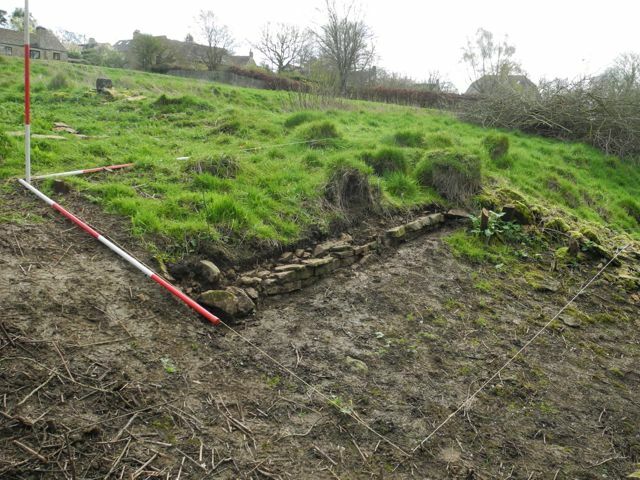 We were able to complete the drawing and recording of the two trenches on the upper terrace and whilst that was underway lay out a new area at the bottom end of the ramp where we met initial traces of walling last time. An area of 6 metres by 3 metres should give us enough to go on in order to decide what kind of function this transverse wall carried out: terracing, balustrade or steps, as well as explore its relationship with the long wall running down the slope. We also had an extraordinary visit from a local; resident who showed us the best collection of local flints I've ever sen outside of a museum! 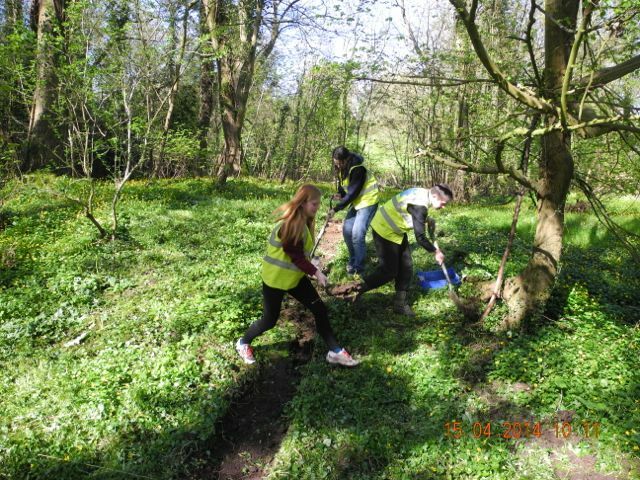 This inspired us to devote a little time one afternoon to field walking on the area that has been ploughed following the removal of the Leylandii and we came up with... nothing. 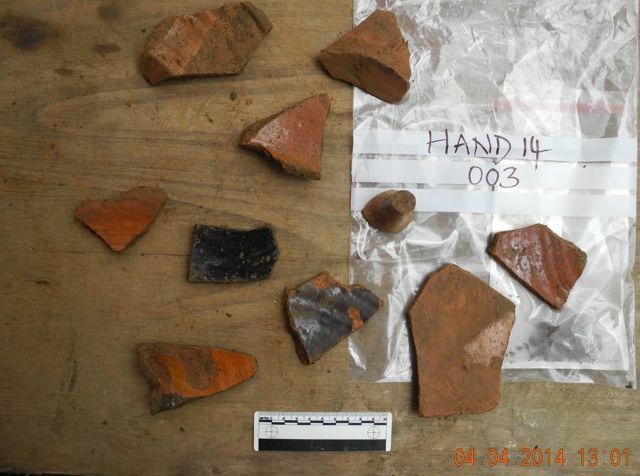 Well nothing except some modern china and a single small abraded fragment of Roman grey ware. It's extraordinary how clean the field north of the barn is. 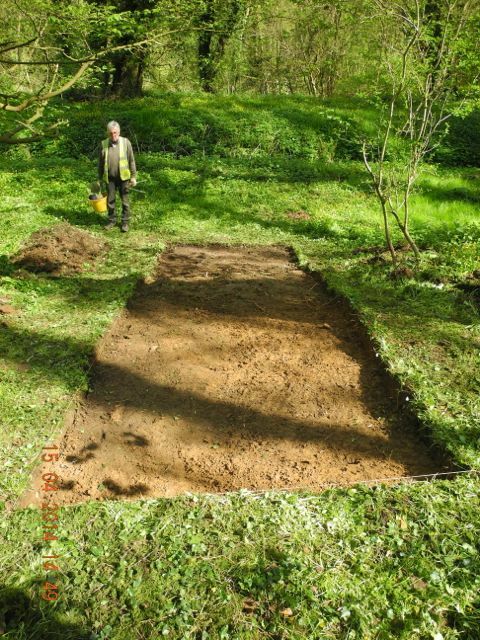 The new area ENA14/C marked out and under excavation, notice the massive anthills courtesy of Lasius flavus the Yellow Meadow Ant (Thanks Peter). Early stages but clearly there are structures associated with the end of the ramp. Still in place on the downhill wall a large lump of atypical ironstone with a possible socket hole! The week beginning Monday 14th. 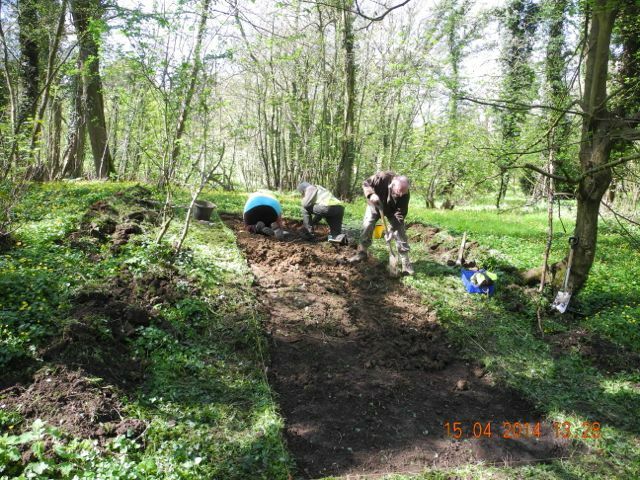 saw the start of a concerted effort at Hanwell to progress work down on the moated area. 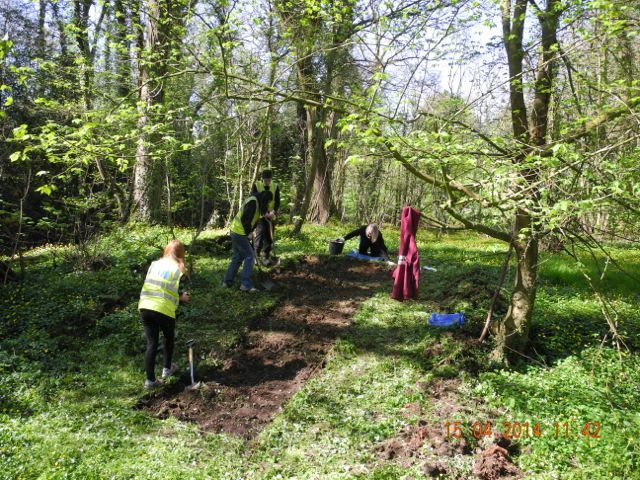 this involved opening up a new area, HANE14, a 6 by 2 metre trench aligned east-west across the eastern edge of the moated platform. We began by stripping off the minimum depth of turf and topsoil on the basis that there could be ephemeral garden features quite close to the surface. 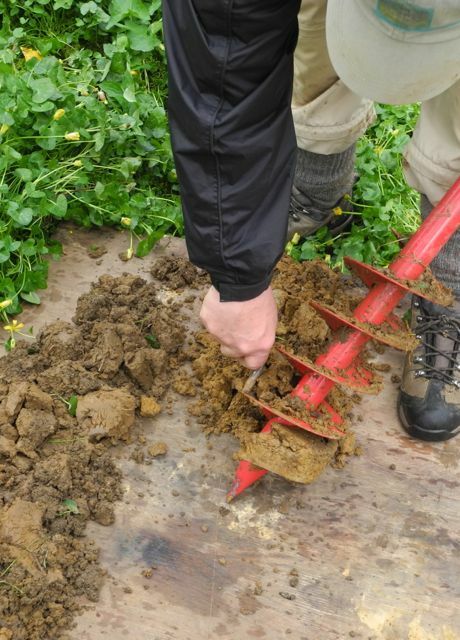 Our coring activities had revealed little in the way of evidence for what toady we would call hard landscaping so a start was made to trowel clean the underlying subsoil and begin the search for the kind of discolourations and changes in texture that could signal earlier planting, fence lines or a revetment. ... and at the end of the day Mike wonders if it was really worth it. 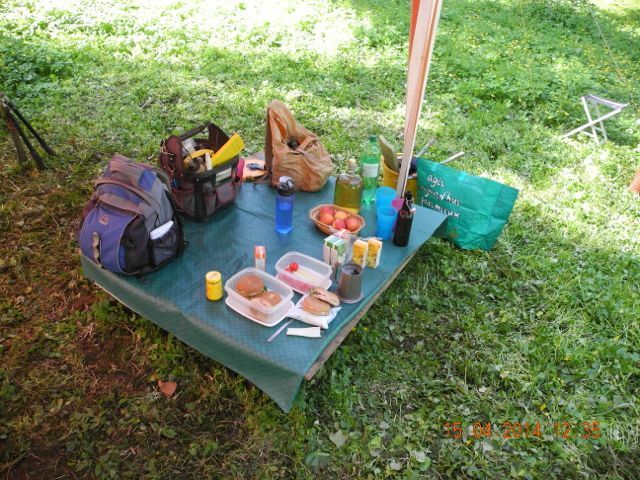 Of course we always look after the creature comforts of our volunteers: lunch time on Tuesday. 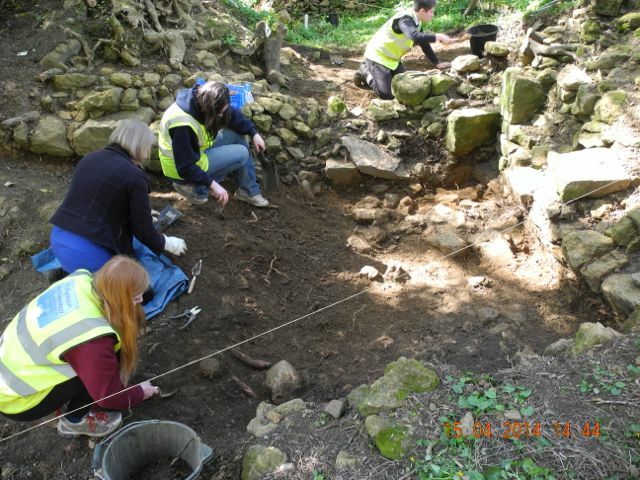 On the site of the so-called second sluice we continued to make progress shifting rubble and gradually unpicking the rather complex ways in which the various walls came together. 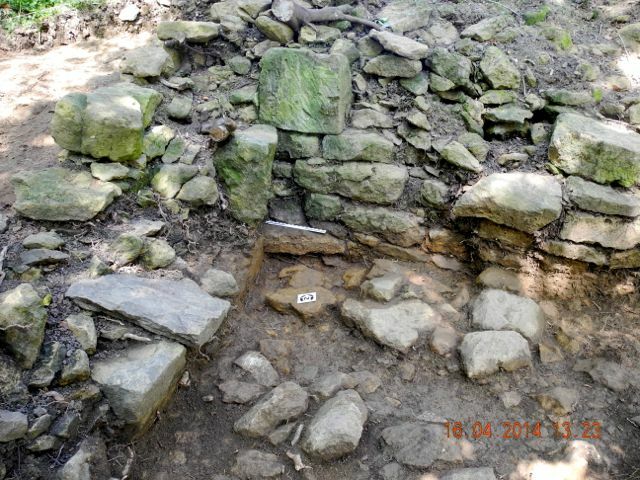 As part of this we examined one or two very large stones scattered around the immediate vicinity. 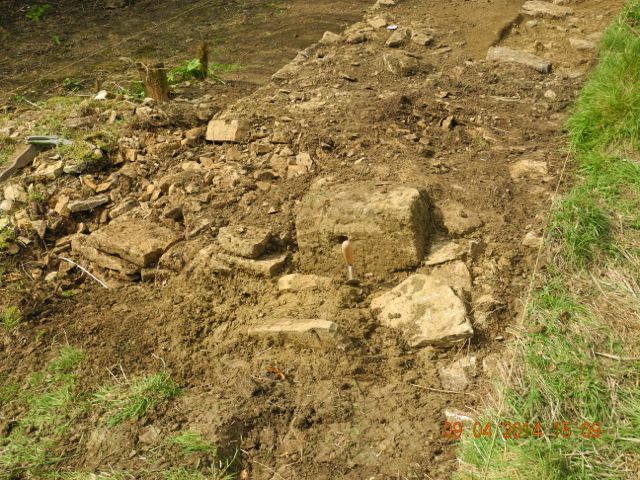 Some of these may have been left over from the recent construction of the little stone bridge but one, when we turned it over, had a fine example of the sort of chased grooving into which lead embedded iron masonry clamps were fitted. 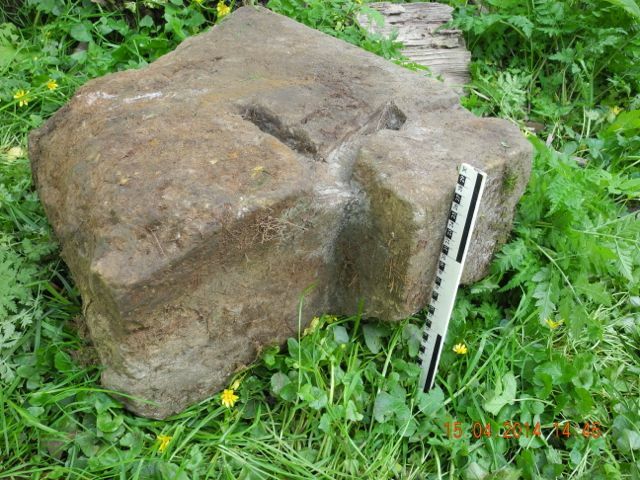 Large scale architectural fragment, I doubt if this will travel far. Rubble clearing and cleaning underway. The north-west corner, there's so much happening here, just not sure what yet. Isobel, Sabrina and Samuel work on after the 3.00 p.m. deadline. 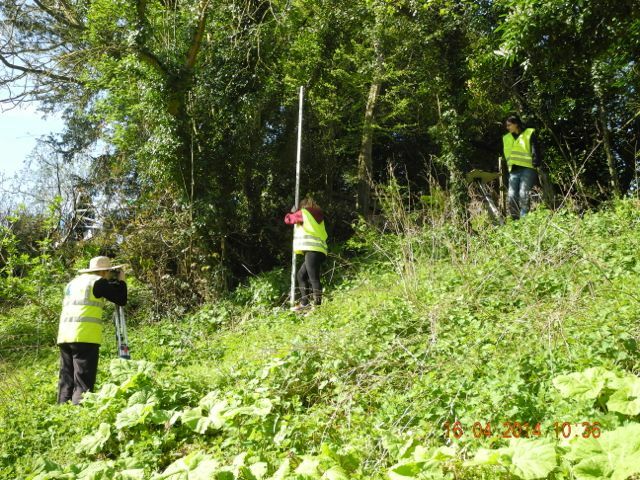 With extra help on hand it was a good opportunity to catch up with some leveling and in particular start measuring and drawing an extended profile which eventually will longitudinally bisect the whole valley and enable us to see how different areas relate in terms of their levels. We started on the top of the level lawn which lay to the east of the castle and from then on it was downhill all the way. 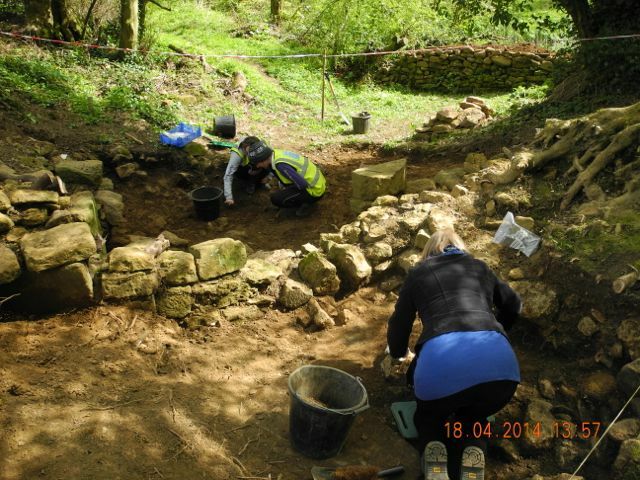 Digging isn't everything, the epic transect of the Great East Terrace, teamwork to the fore. And here is the first part drawn up. 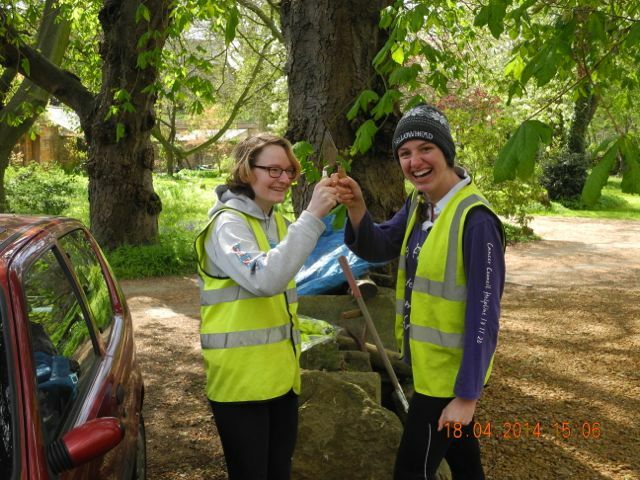 Thursday was fairly quiet but on the Friday we were joined by Kathryn and her friend Eve, our Amsterdam contingent and so were able to expose more in the way of stony surfaces. 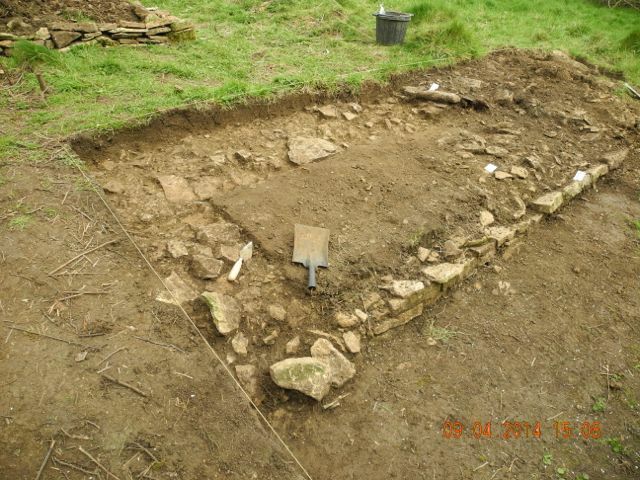 the section over on the edge of moat was also completely cleaned up revealing.... well one or two suggestive patches. We'll leave it for a couple of weeks and give it another scrape. Sometimes quite ephemeral features show up after a little weathering. HANE, some patches of darker earth, possibly evidence of planting. Working hard on HAND upstream and downstream of the blocking wall. 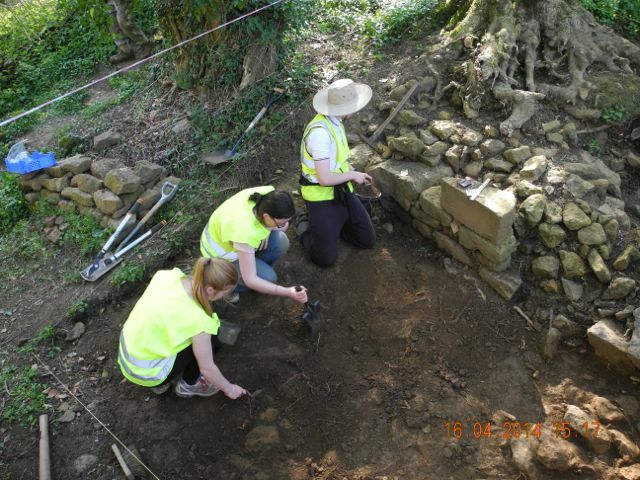 More stony surfaces, plus Eve celebrates with Kathryn her first experience of digging, looks like it went alright.